Four murder mysteries starring John Nettles and Jason Hughes are coming to Blu-ray in February. In an early announcement to retailers, Acorn Media has just revealed 'Midsomer Murders: Set 19' for Blu-ray on February 28. Set 19 includes the following four episodes: The Made-to-Measure Murders, The Sword of Guillaume, Blood on the Saddle, and The Silent Land. The release will be a 2-disc set and will have 1080i video, an uncompressed 2.0 soundtrack, and the only supplement will be a photo gallery on Blood on the Saddle. Suggested list price for each Blu-ray set is $59.99. 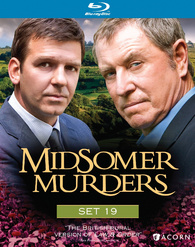 You can find the latest specs for 'Midsomer Murders: Set 19' linked from our Blu-ray Release Schedule, where it's indexed under February 28.